Football or Baseball Changeable Jersey Display Case - Museum Quality - Hardwood - 99% UV Protection Glass | Sports Memorabilia! This will be one of the best jersey display cases you ever buy. 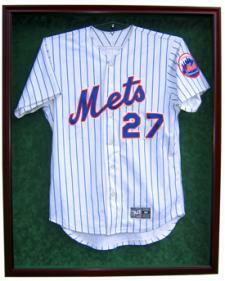 Each display case is made of hardwood and 99% UV protection beveled glass to help prevent any fading of the jersey or autograph. You have your choice of 4 wood finishes and 9 mat colors to match your team. Each jersey display case comes with a lock and key setup and opens from the front allowing you to easily change the jersey at any time- great for the collector with more that one jersey. Two different hangers are provided, one for baseball jerseys and one for football jerseys. 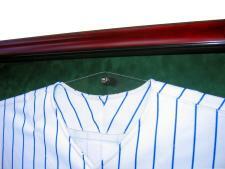 The outside dimensions of the jersey display case is 32.25" wide, 40.25" tall and 3.25" deep. The glass area for the front of the jersey display case is 29"x37". The hanging weight without the jersey is 28 pounds. If desired an added feature to hold an 8x10 photo is possible for only $25 more. 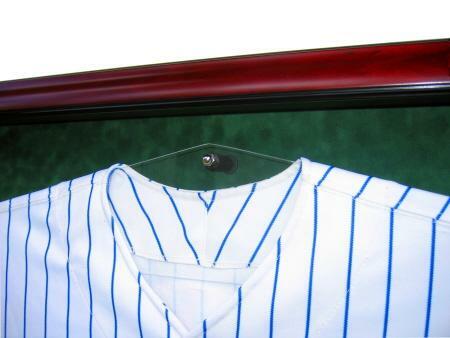 This frame is attached to the inside of the display case allowing the photo to be visible through the lower right front glass area with space behind the photo for the jersey to hang behind the photo. The framing around the 8x10 photo will match your choice of wood that is being used for the front door. This request must be made at the time of placing your order. If selected, the $25 will not be reflected in your shopping cart but we will process your order with this additional cost. 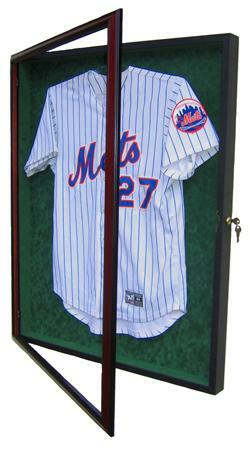 Each display case has a solid wood shadow box and a solid wood finished door. The outside of the shadow box is black and you have choices for your inside suede mat. In addition you have choices for the desired wood finish for the front door. The picture reflects a green suede mat and a mahogany front door. Please visit this link Solid Wood Finish and Mat Color Choices to see your options for wood finishes and mat colors. The jersey display case comes ready to hang with the hardware already mounted to the display case. The matching hardware for the wall is also included. This innovative hanging hardware is extremely easy to use. Every display case is hand made in the USA and made to order. The jersey display case ships with extensive packing materials and in a special made wooden crate - this cost is included in the shipping fee. $45.00 shipping per display case to CA, WA, OR, NV and AZ. While not reflected in your shopping cart, $40.00 extra will be added to the shipping cost for all other contiguous states. This item ships by UPS.